I spent Wednesday afternoon and Thursday morning with over 200 young ladies at a nearby local high school. The organizer had called me up after receiving some recommendations from the other speakers she had lined up that week as well. The week long seminar was designed to empower these young female students with leadership and life skills by providing a personal testimony of our own examples and an inspiring speech. Honestly, I was floored. I had a blast. Of course, I got choked up when I spoke to the girls about a few parts but made sure to emphasize the silver lining of it all… after all, it was supposed to be an inspiring talk – not a sob story and not a braggart story – but a story that told them that there will be times in your life when you’ll be knocked down to rock bottom and you’ll have to find the courage within yourself to get yourself back up. It’s a story about hope, determination, love, stewardship, sacrifice and faith. 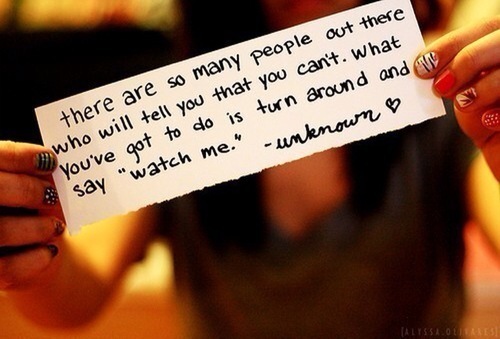 And when someone say’s that you can’t do something, turn around and tell them “watch me”. I was a little —- no—- I was really very very very nervous in the beginning. I feel so much more comfortable typing my feelings and experiences on a computer rather that talking about them under a spotlight in front of a couple hundred strangers staring at me. But I needed to say it out loud. To them. For me. I cried. I warned them about my crying even before I started so I guess I was covered on that but I cried a lot. There was one time that I had to stop, wipe my tears and take a few deep breaths… I’m sure the silence was awkward for them. And I managed to struggle through with two ovations to boot! My story was unique in that it touched each one of the topics over the several days. My story was NOT unique in that EVERY speaker began the same way and ended the same way and each of us stressed to the girls that no matter what adversity life gives you, keep going after your dream. There was a defining point in my speech where all their eyes were fixated on me. Come to think of it… It was quite the defining point in my life as well. It wasn’t planned that way, at least no one told me about it if it was, but each speaker began their speech with “I am no different from you. I am not any more special than you.” We were all from this community. We were all from humble upbringings. We all had similar values – family, education, God, health, community. We had all been given opportunities at one point or another and it took sacrifice to receive those opportunities. We had all had a visit and tour around rock bottom. We all lived to tell the tale. And we all did pretty good for ourselves. Sound familiar? Maybe a little like you? I know my story has a lot of death in it. I try very hard to let people know about the experience of death, witnessing it, dealing with it and doing all you can to move forward through it in a healthy way without making it sound like I’m dwelling on it. Yes, it has been very very difficult but I also had to remember that I have two boys that still need me healthy, happy and alive for them. So when people connect to my story, I know deep inside that they have a rock bottom experience as well. That’s when I turn it on. One girl raised her hand to ask a question but immediately got incredibly timid when I asked her to repeat it because I couldn’t hear her. She repeated it again but even softer and then shook her head and said “nevermind”. I knew immediately… this was an important question. So, I didn’t back down. I stayed there until she said the question aloud again for everyone to hear. It was important for everyone to hear this. No question was silly, stupid or unworthy… especially this one. “Yes, I went to therapy. I still go to therapy. Running has become my therapy. There are some days when I train in groups for events. And there are some days when I run by myself for this very reason. I need to be alone with my thoughts, with myself and I pray when I run. It’s ok to feel sad sometimes. But we HAVE to find it within ourselves to get ourselves out of it and find happiness again.” I wish you could have seen their faces when I told them it was ok to feel sad sometimes. It was as if I had given them permission to be normal. It’s been proven that physical exercise helps us cope and reduce our stress levels. Clearly I could have gone the other way and fallen quickly into the rabbit hole of depression. But I didn’t. Running saved me. Team in Training saved me. I am a sole survivor. I just spoke to the most amazing group of young women and my heart melted when a swarm of them caught me as I was leaving. They each asked me to take individual photos with them and spoke to me about their own experiences with cancer and their own “impossible goals” that they want to achieve. Honored and humbled and a smile from ear to ear!!! I lost my beautiful close friend Jana Miller. A brilliant doctor, fun loving and kind hearted. She was diagnosed at stage IV during her 3rd year of med school. She finished, practiced and became an active member of the community. Few people knew she lived ten years with cancer. Her smile fooled everyone. I’m sorry. I still can’t talk about my Momma. This entry was posted on January 25, 2014 at 2:46 am and is filed under Uncategorized with tags araceli chavarin, cancer, empowerment, female empowerment, girl power, leadership, leukemia, leukemia and lymphoma society, LLS, lymphoma, marla cuellar, metamorphosis, mission moment, sarah hammond, Team in Training, tnt, weslaco high school. You can follow any responses to this entry through the RSS 2.0 feed. You can leave a response, or trackback from your own site. As a way of remembering why I do what I do, I’m going to reblog some of my most special moments that have carried me along my journey. the messages that I have written in and have learned from are lessons that go far beyond just running marathons or triathlon or century bike rides… they are lessons for living life in a happy and healthy way.